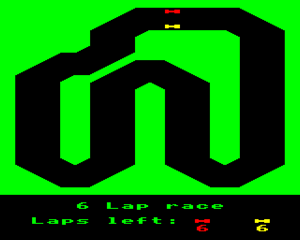 This is just a very quick pedal to the metal racer for one player against the computer. The game features three tracks of varying difficulty for you to race around. Control keys are < and > for steering, but there is no accelerator - this is flat out all the time. The program is supplied in SSD (single-sided disk) format, so that it can be easily imported into your favourite BBC Model B emulator (other Acorn emulators may also work, but are untested).